The U.S. men's national team has been eliminated by Ghana in each of the last two World Cups. NATAL, Brazil — For the United States to take a giant step forward in the World Cup, the Americans will have to exorcise some ghosts of the past. They kick off their tournament Monday in Group G against nemesis Ghana, which has eliminated Team USA in the past two competitions. The Americans claim they will not be seeking revenge, but playing for World Cup survival at Arena das Dunas. In fact, they have downplayed those last two losses that led to their elimination, 2-1 results at the 2006 and 2010 cups. Midfielder Michael Bradley and forwards Clint Dempsey and Jozy Altidore also were teammates who tasted defeat in South Africa. But there are other motivating factors. Both teams need a win and three points if they have any chance of getting out of what has been called the Group of Death. A loss or a draw would surely torpedo U.S. hopes of securing a spot in the Round of 16. Their task will become even greater as they will meet Cristiano Ronaldo and Portugal on June 22 and Germany on June 26. “It’s a fresh slate, an opportunity to prove to the rest of the world that you’re a quality side,” Dempsey said. 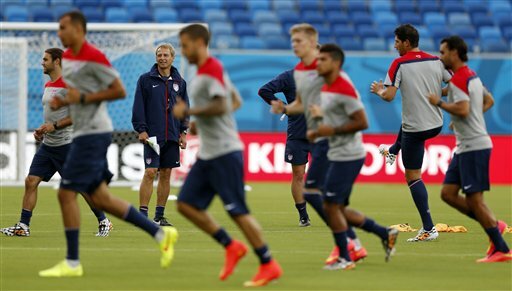 With the USA playing in its seventh consecutive World Cup, there are greater expectations. “It’s still up to us when we step onto the field tomorrow to give everything and to enjoy the moment, to relish the opportunity of playing in the World Cup, of representing … our country,” Bradley said. This east coast city, which has a reputation for 300 sunny days a year, has been besieged with rain the past few days. But forecasts call for no rain. “No matter what the circumstances are, no matter how a game goes, this group is ready to go the extra mile to make it happen tomorrow and get them started with a win,” USA Coach Jurgen Klinsmann said. Anything else but a victory could be devastating.